I swear a giant pile of spinach never tasted so good! OK but really, this classic dish has a perfectly seasoned chicken breast, spinach cooked with onions and garlic all covered in a creamy white shine sauce with lots of gouda for good measure. It’s really easy and on the healthier side of edible dinners 😂 Whenever I’ve tried to make super-health meals with no sauce or zero fat I just end up not eating it and it’s a waste of time, food and money. I really think this type of dinner strikes teh balance between health and satiation. 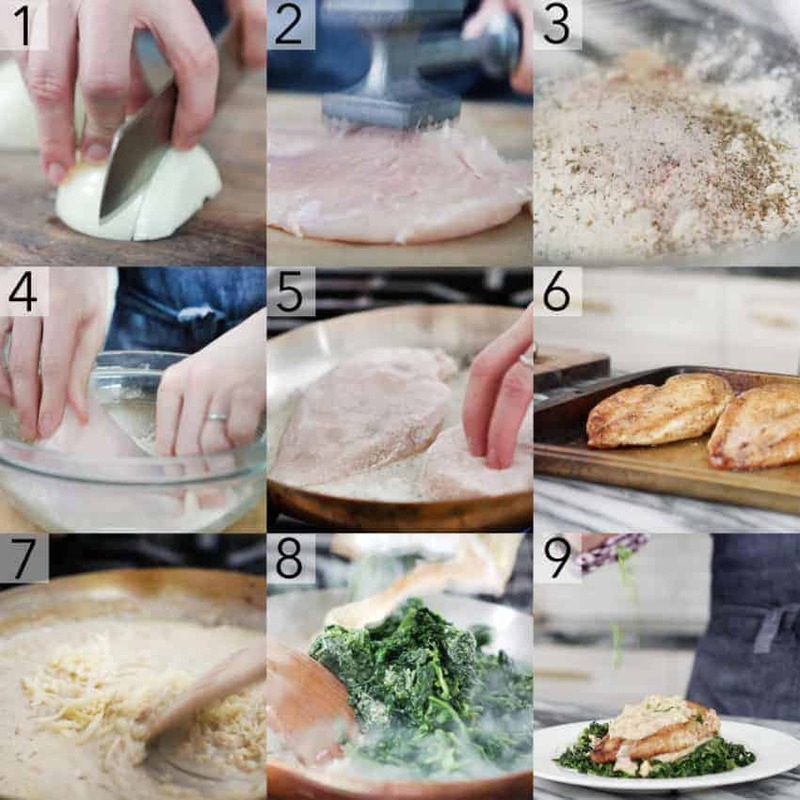 For this recipe you’re seasoning and browning some chicken breasts, popping them into the oven and while they bake you make the sauce and spinach so it all comes together roughly at the same time. I mixed up a some flour and seasonings to dredge the chicken in so it would brown a bit easier but it’s really optional. If you’re running short on time then go ahead and skip that part. I loved this dish served with some nice rice and because my husband and I are forever on a regime of some sort the rice is mixed 50/50 with riced cauliflower, which I steam. As long as there’s a bit of rice one the plate my brain is tricked into eating all that cauliflower and some calories are spared from my waistline/saved for cake. 1.Preheat oven to 350F. Dice onion and garlic. 4. Dredge chicken in the spice mixture. 5. Sauté chicken over medium heat until golden. 6. Cover with foil. Bake for about 20 min. 7. Cook butter, half an onion, half the garlic. Add wine, milk and gouda for the sauce. 8. Add the other half onion, half garlic, spinach. Cook down. 9. Scoop a bed of spinach, sauce, chicken, sauce and a garnish of parsley. If you’ve tried this out then don’t forget to rate the recipe and let me know how you got on in the comments below, I love hearing from you! 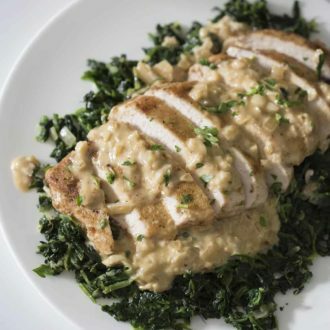 A delicious plate of baked chicken over a fluffy bed of spinach and the perfect sauce. In a bowl, combine flour and spices. Whisk together. Clean and prepare chicken breasts. Dredge or dip chicken breasts in the flour seasoning mixture. Tap off any excess. Add butter to a pan over medium high heat. Cook the chicken breasts until golden brown flip and repeat. Transfer the golden chicken breasts to a baking sheet. Cover in foil. Bake for about 20 minutes. Dice an onion. Mince garlic. In a pan over medium heat, add 2 tbsp butter, 1/2 diced onions, 1/2 minced garlic, salt and pepper to taste. Stir frequently and cook until translucent. Then add the spinach. Stir until spinach has cooked down. In another sauce pan, sweat out the rest of the onions until translucent over medium heat. Add garlic. Stir frequently. Add wine. Cook until reduced. Add milk and gouda. Mix. Transfer a bed of spinach to a plate. Spoon some sauce over the bed. Add chicken, more sauce and a garnish of parsley. If you're not a fan of spinach try subbing in Swiss chard! When using fresh spinach remember to use a large pot and triple the amount you think is needed. It cooks down to almost nothing! 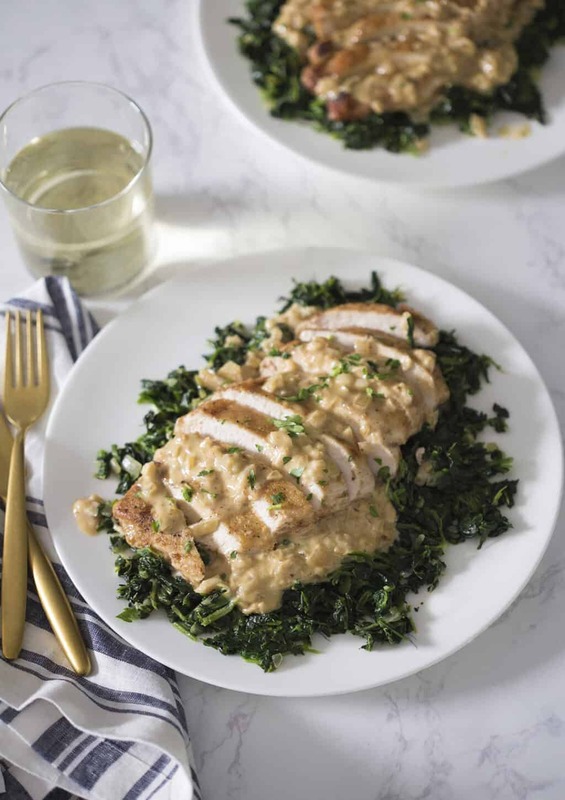 This dish makes a really easy family dinner and you can do a lot of the prep work in advance.Spinach and sauce can be prepared beforehand so you can just make the chicken and assemble before serving. Forever on a regime of some sort…haha love it! Can’t wait to try this! It’s so yummy! Hope you enjoy! This looks incredible! Can’t wait to give it a try!